The fossils we found this month will go into a temporary set of drawers in the museum for further processing. Today, I’m working in the prep lab on a fossil found two years ago. Many of the fossils we’ve been finding are on the surface. “Digging” for fossils is pretty rare here. There’s a surfeit of fine ones to be plucked off the ground. But sometimes in the canyon, you see a gleam of a tooth, and then an inch or two of curved jaw, and you know there’s something better encased in the rock behind it. Plaster, rock hammers, picks are used to ease the thing out--often over the course of a week or two. It comes out with plenty of extra rock around it. Such is the jaw I’m working on right now. It’s another oreodont. 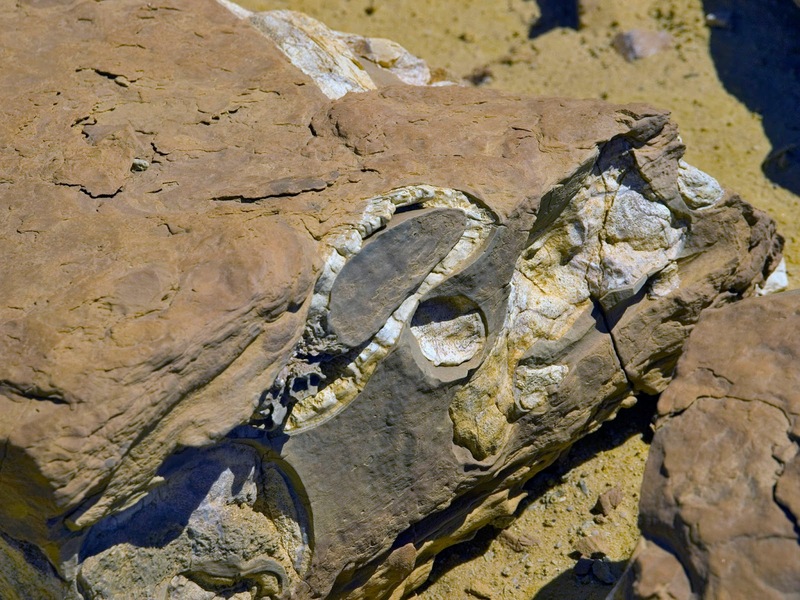 The rock--called “matrix”--needs to come off to reveal the fossil itself. Last week, I finished the top of the skull. There’s a beautiful pearlescent quality to part of it. I hit one difficult patch, but most of this one is coming along easily. There are people who can do picky, fine work. I’m one of them, so this is my favorite part of the work. (That it’s done in air conditioned comfort is no small part of that.) I can sit for three hours, hunched over a microscope, my work in the eyepiece, and wield the tools of fossil cleaning on the specimen. The primary tool I use is a pneumatic scribe, a vibrating needle that grinds away the matrix. It takes some practice figuring out the right angle and the right pressure to use--and that changes between the easier fossils and the harder ones, between bone and teeth, between animal and vegetable. I cheat a little bit today and work at the side of the jaw, the thing that was exposed and let the paleontologist two years ago see it was there. Teeth are so easy to clean, so forgiving. It’s a joy to work at the side of a few molars. And it’s fascinating how different the molar surface is between species. Even I can tell at a glance a rhino from a mammoth from an entelodont from a camel from an oreodont. They each have distinctive cusps, or bumps. 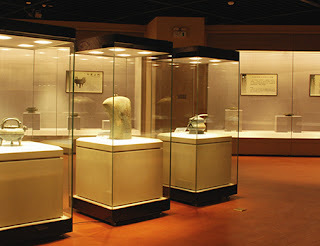 After three hours, I stretch and walk around the museum, answering a question for a tourist. Then I go back into the lab and switch tasks. I’ve been left with a bag of broken bones from earlier this year. It’s a 3-D jigsaw puzzle, and I’ve put it about half together. I’m thinking I might have more than one bone here. I have enough together I know that one is a vertebra. Naked eye, I gently try a couple of pieces against each other. I move to the microscope when I think I have a fit. I do! Another bit added. I get out the polyvinyl butyral dissolved in acetone to glue them together, using toothpicks to hold the bones in place until the glue sets. I try another bone fragment in several places, finding no matches, and then I’m done. I put the tray back in my work area. I know the paleontologist comes by and checks my work from time to time, making sure I’m not messing up too badly. There are fossils here so fragile or so important, I’m not let near them. After lunch, I’m pulled aside to help carve a resting place for a camel’s pelvic bone in a chunk of museum-quality foam. I cradle the bone in both hands, nervous as all get-out, I promise you, as someone else uses an electric knife to match the impression in the foam to the shape of the bone. The knife is just like the one you might use on holidays to carve the turkey. 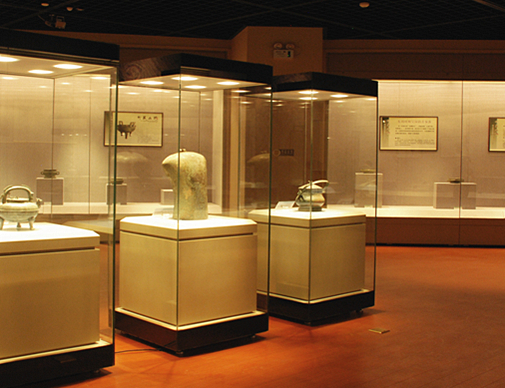 When it’s ready, we move it out to a new exhibit in the museum. This takes four of us using eight locking suction cup devices to lift a heavy glass case. It’s like a scene out of something like Ocean’s Eleven (minus six), where they rob a museum. First, the guy who was using the knife flips off the alarm system--which is deafening when it is triggered--and then we lift the glass case. It’s heavy. I’m not sure why the alarms, because it really is a four-person job to lift this thing. It’s not something you could sneak in and do in thirty seconds, even if you did your tourism with eight locking suction cup devices in your backpack. Knife Guy rearranges the exhibit and adds the camel bone. He takes out a femur of a different camel, needed for study, and we lower the cabinet, lock it, and he re-sets the alarm. I go back to work on the oreodont skull. I watch, during the breaks I take to rest my eyes, the paleontologist with the femur bone. She has out calipers and is measuring the distance between various bone markers. There’s some discussion in the field of splitting one camel species into two. If they do that, which is this bone going to be? A pile of scientific journals is open to the relevant pages. She takes pictures from time to time, and sometimes she asks me to hold a flashlight to illuminate a bit of bone correctly. I’m down to halfway down in the oreodont’s cheek. It has a very deep lacrymal fossa, a dent that held a gland. That it’s so deep will probably help them know exactly what species it is. I’m stiff from working in one position, so I wander outdoors and walk around. Were it not for the scorching summer heat, it’d be a beautiful day. It’s beautiful for about five minutes until I escape to the air conditioning. Tomorrow, it’s back out into the field, to hunt for more fossils, teeth and bones the hard rock is yielding back up to us. 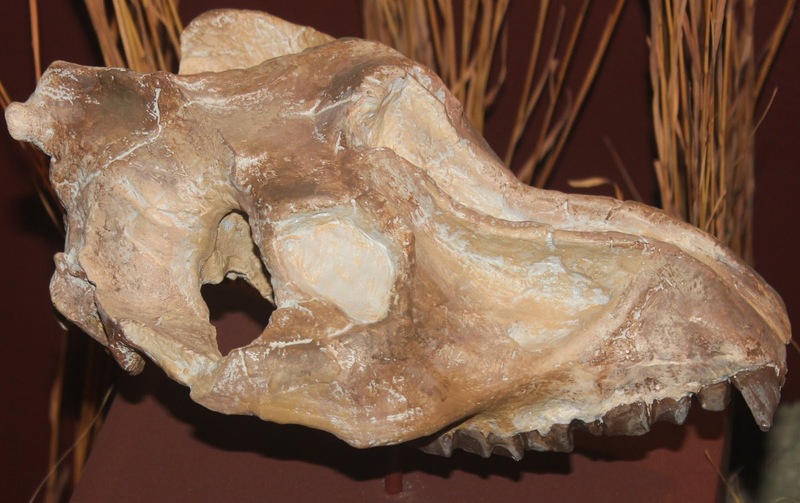 In the center of the museum entrance is a huge entelodont’s head and neck, the flanges flared out impressively, the fossil teeth sharp enough that there’s a sign warning people not to touch them. Thirty million years after it died, its teeth can still draw blood. In my time here, I have begun to long to be fossilized. It’s unlikely to happen, but I wish for it nonetheless. It’s as near to immortal as any of us might be.